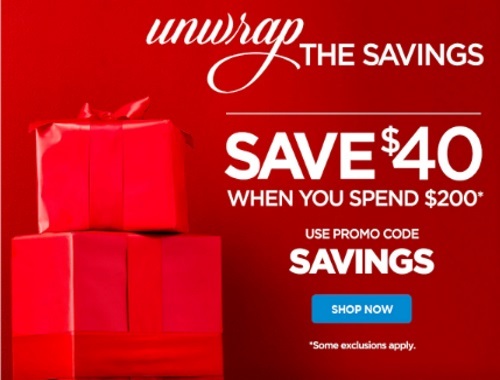 The Shopping Channel has an UnWrap Your Savings offer on now! This is perfect for Christmas shopping! Save $40 off when you spend $200 or more! Enter the promo code SAVINGS at checkout. Offer is valid through November 18 2016 T 9:59pm ET. Offer cannot be combined with any other offer or discount (including Rogers employee discounts). Promo code may be redeemed on order total before S&H charges and taxes. Promo code cannot be redeemed on KitchenAid, Vitamix, Dyson, Pink Tartan, Ron White or Rapisardi merchandise, Coins & Banknotes, Electronics, Electronic Accessories, Gift Cards, Auto Delivery items, our Today's Showstopper offer, Encore Today's Showstopper offer or Exclusive For You Today's Showstopper Presale offer, or redeemed for cash, or used towards payment of the TSC Credit Card. All “Last Chance Price Final Sale” item sales are final, no returns or exchanges.